> Successful Aboriginal business? You bet! Aboriginal businesses are equally successful as any other. But they have one unique advantage when it comes to overcoming challenges. What is an 'Aboriginal business'? Definition: An Aboriginal and Torres Strait Islander-owned business has at least one owner who identifies as being of Aboriginal and Torres Strait Islander origin. self-identification is accepted for a person of Aboriginal and Torres Strait Islander origin. The above definition includes businesses where there is equal ownership between Aboriginal and non-Aboriginal persons (e.g. a mixed couple) or there is Aboriginal minority (less than 50%) ownership in a business. Definition: An Aboriginal and Torres Strait Islander-owned and controlled business is one that is majority owned by Aboriginal and Torres Strait Islander persons. majority ownership is considered to be a proxy for control. With Australian media blasting out negative news about Aboriginal people it is difficult listening to the quiet stories of Aboriginal success in business. But they are everywhere, like refreshing oases dotting a dry media desert. Many Aboriginal businesses have only formed in the early 2000s, and their stories are seldom told. Their biggest challenge is educating the local market that Aboriginal business can add significant value to the economic landscape. Unlike non-Aboriginal farmers who often have been in business for generations, Aboriginal farmers acquire land after many years of separation from the land  and have to learn the skills from scratch. A challenge unique to Aboriginal business owners is their Aboriginality. The media has been successful in equating Aboriginality with failure in many Australian minds. While Australians have no problem acknowledging individual success, like that of sport legend Cathy Freeman, they struggle attributing it to their Aboriginality. But when Australians come to consider the perceived failings of an Aboriginal person, they almost always attribute it to their Aboriginality . Glen Brennan, a Gomerio man from Narrabri in northern New South Wales and State Director Victoria, Government, Education and Community with NAB, knows that Aboriginal businesses face the same sort of challenges as mainstream businesses. But he also knows they have a secret ingredient that helps them survive and strive. "Indigenous businesses will be required to show the adaptability that made our old people here truly successful in this country for millennia," he reveals. "It’s that same level of adaptability that entrepreneurs are going to need to show in a world that’s continually changing." A "unique branding advantage" of Aboriginal farms is the growing and significant demand for Aboriginal-branded food products, for example honey and bush foods. Aboriginal businesses are also pivotal in recruiting Aboriginal employees. "With employment, Aboriginal [businesses] recruit, retain and train more Aboriginal people than any other business group or sector in the country," observes Tony Wiltshire, general manager of the Pilbara Aboriginal Contractors Association (PACA). Since 2007, the Office of the Registrar of Indigenous Corporations prepares a Top 500 Aboriginal and Torres Strait Islander corporations report which collates and compares a range of data provided by corporations as part of their annual reporting. Where can you find Aboriginal suppliers? More and more organisations and companies are implementing Reconciliation Action Plans (RAPs). A common element of their RAP is to liaise with Aboriginal suppliers. But where can you find them? Supply Nation wants to ensure that small to medium Aboriginal businesses have the opportunity to be integrated into the supply chains of Australian companies and government agencies. Commencing in 2009 as a 3 year pilot project, Supply Nation is a not-for-profit membership body and is funded by the Australian Government Department of Education, Employment and Workplace Relations, as well as Industry & Investment NSW. After successfully completing the pilot phase, AIMSC rebranded to become Supply Nation in 2013. Founded in 1999, Black Pages is Australia's first national Aboriginal business and community enterprise directory. It's a marketplace for businesses, government agencies and communities. As an Aboriginal-owned business, it builds and promotes Aboriginal business entrepreneurship and works with government, industry and communities to improve socio-economic development and outcomes for Aboriginal people. Apart from listing Aboriginal businesses, Black Pages also includes supportive non-Aboriginal businesses, government agencies and other groups. The deal, although having been subject of inquiries and controversies, was a big step towards Aboriginal self-determination in Central Australia. Through a local organisation, the Anangu people acquired a stake in the enterprise and now play a role in resort operation and management. A year later, in 2011, the ILC established a national Indigenous tourism training academy at Yulara. 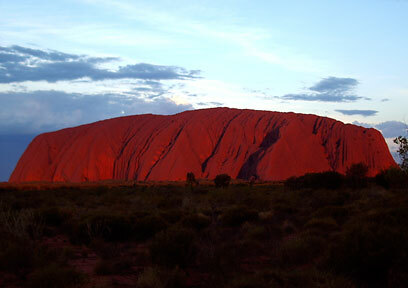 Year Uluru was handed back to traditional owners (26 October 1985). Tess received support from Indigenous Business Australia (IBA) which helped her write a business plan and gain accreditation to operate out of Kakadu National Park. She took out a loan to finance her tour vehicle, contrary to some people's belief that she received it from the government. Imparja Television is an Aboriginal-owned broadcasting station in Alice Springs, NT, operating since June 1988. Its services include National Indigenous Television (NITV) which was launched in mid-2007, and eight Aboriginal radio stations . Nine Imparja has the largest broadcast area in Australia, covering 3.6 million square kilometres across six states and territories with an estimated audience of 430,000 people. It comes free-to-air and competes with the national market for advertising revenue. advances the commercial and economic interests of Indigenous people by accumulating and using capital assets. One of the tasks of IBA is to help Aboriginal people achieve home ownership. In 2001 Indigenous home ownership was at 32% while the national non-Indigenous average was 68% . IBA wants to raise this rate to 40%. In 2008 its customers come from NSW (29%), QLD (27%), NT (16%), VIC (10%) and WA (8%). In 2001, Westpac and the Boston Consulting Group launched Indigenous Enterprise Partnerships, renamed in 2010 to Jawun (meaning "friend" or "family"). Jawun brings together business people with Aboriginal communities. Usually sent out on 5-week assignments, the corporate experts find the holes in local know-how and match business experience to the community. Among other things they help run businesses professionally, improve board reporting, deal with governments or secure grants . Businesses involved include KPMG, IBM, Wesfarmers, Rio Tinto, Leighton Holdings, Woodside, BHP Billiton and Qantas. Projects operate in Cape York, Arnhem Land, the Central Coast, inner Sydney, the Kimberley or the Murray area. People from the Jilkminggan community in the Northern Territory who wanted to buy good food for their families had to travel 300km to Katherine and back because their store's stock was mostly unusable and very expensive . The local Dungalan Aboriginal Association decided to improve the situation. Together with Outback Stores and the Federal Government Department of Families, Housing, Community Services and Indigenous Affairs (FaHCSIA) the community store was overhauled and re-opened, meeting all safety and health requirements. The new store now has a good chance of making a strong return for the community and delivering better health outcomes for the people. When Daniel Tucker and his brothers were trying to break into the mining industry, they found people were often reluctant to give them work in the industry. Instead they offered them minor jobs like gardening and fencing. Rather than become discouraged, the brothers were inspired to establish their own mining company—Carey Mining—in 1995. Carey Mining now has contracts with big companies such as BHP Billiton Nickel West and Rio Tinto, and also runs a training scheme for Aboriginal students. In 2010 Carey Mining won the inaugural Indigenous in Business Award at the Ethnic Business Awards ceremony in Perth . The above story is not unique. "Aboriginal people want real jobs," says Alison Anderson, a Northern Territory politician and Independent Aboriginal MP . "They want to be trained as plumbers, as carpenters, instead of bringing in people from the outside to take all the money." Many Aboriginal people have "up to six or seven certificates" from training but still cannot get a "real job" Anderson observes. Dowrene Farms, part of Western Australia's Noongar Land Enterprises Group, is one of very few Noongar-owned and operated farms in the region. After years of being leased out, 2018 was the first year of operation in Aboriginal hands. 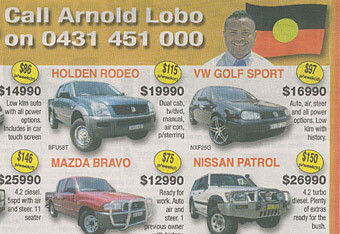 Aboriginal business ad. This ad appeared in an Indigenous newspaper. It is proof of the success Aboriginal people can have in business. Advertisements for Aboriginal businesses which fly the Aboriginal flag are still a rarity. More and more Aboriginal people are able to get a better education, despite a huge lack of government support in that area. Adverts like this debunk the myth of the 'lazy Aboriginal' and are testimony to a new class of business people of Aboriginal descent. The Indigenous Governance Awards celebrate real stories and real case studies from finalists and winners of the Awards, held since 2005 to identify, celebrate and promote effective Aboriginal governance. Getting Down to Business is a film shown to raise funds for the Indigenous Communities Volunteers Foundation (ICV). The ICV works in partnership with Aboriginal and Torres Strait Islander people to design and implement community development projects. 'Business Longitudinal Analysis Data Environment', Australian Bureau of Statistics (2016) – Customised dataset based on Supply Nation registered Indigenous businesses prepared on behalf of PM&C.